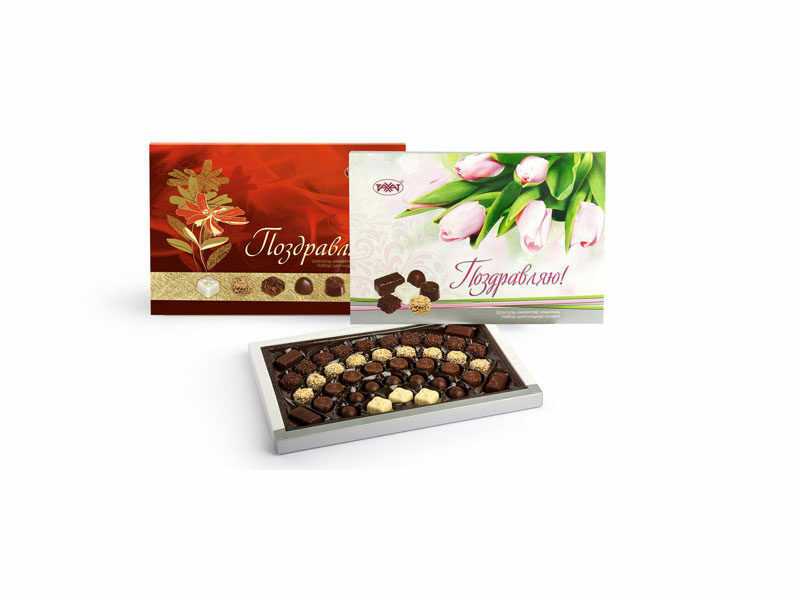 Home › Products › Candies › Candies in fancy boxes › Pozdravlyayu! «Mechta» truffle paste coated with chocolate and chocolate spread. Ingredients: sugar, cocoa mass, glucose syrup, cocoa oil, vegetable fats (palm oil, soya oil, coconut oil), kernel of crude almond, dairy butter, whole milk dried, water-holding agent – sorbitol; ethyl alcohol, whey solids, condensed milk sugared, wheat flour, cocoa powder, gelling agents: pectin, agar; neutralizer – citric acid; egg-white dried, stabilizers: invertase, sodium citrate; corn starch, egg powder, emulsifiers: soy lecithin, Е476, Е471, E492; common salt; aerating agents: baking soda, ammonium carbonate; maize oil, glazing agent – talc; glazing agent – beeswax; aromatizers are identical to natural; vanillin, extract of natural vanilla are intensifiers of taste and smell, Е120 food colouring agent, enzyme (protease).